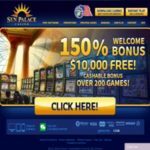 Short Business Description: SunPalaceCasino.eu is an online casino that caters to thousands of casino players around the world. SunPalaceCasino.eu is a top online casino that has been in business since 2002. In addition, they are part of the Main Street Casinos Group which is known for providing quality online casino websites. Sun Palace Casino is licensed out of Costa Rica and incorporated in Nicosia, Cyprus.